Here are some frequently asked questions to help kick start your semester in PULSE! Q: Is PULSE a step-by-step curriculum? A: Think of PULSE as an online textbook. You can progress through the curriculum from unit 1 through the end of the units, and you can skip around as you wish. Q: How do I determine where my students should start in PULSE training? Q: What specific steps should I consider to get the most out of PULSE? 3. Use the PULSE Index. Learn more about each term or topic and its related resources or activities throughout the PULSE website. Keep in mind there are no direct links to these pages but that will be implemented in the future. You can use the PULSE Index to find more resources and activities based on the PULSE Songs. Games and widgets also reinforce curriculum goals and students enjoy these activities. 4. Use the PULSE Songs in your classes, ensembles and private lessons. PULSE Songs reinforce knowledge based on the Unit objectives and are listed on each Study Room page that has been selected. 5. Download the sheet music for each song. Sheet music is available on the Teacher Resources page. 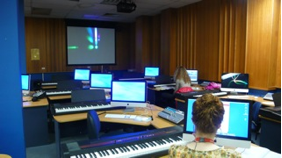 In the Listen Room you can explore video/audio versions PULSE Songs being performed by a variety of artists, animations of Study Room Tables (Form, Melody, Rhythm, etc.) based on PULSE Songs, and many other video/audio resources. The Listen Room has a search feature and you can create/save playlists that are useful for lessons. You can also study arrangements of the PULSE Songs in the Jam Room by using the Notation Mixer Tool.